1)Cleaning the body through the use of fasting. 5)Strengthening the body with water. Hot water draws blood to the surface of the skin, sort of like a protective wall from the heat which causes the vessels to expand. Cold water instinctively causes the opposite effect, with the vessels tightening, draining blood out of the extremities with all of the lactic acid and built up toxins along with it. Within moments the skin and muscles are bombarded by fresh new blood coupled by loads of oxygen. The sudden rush of blood and oxygen has a few peculiar effects such as: stimulating glandular activity, increasing muscle tone and nerve force, improved digestion and increased metabolism, boosting the immune system, increased blood count, stimulates the brain and central nervous system, and of course improved blood and oxygen flow. There was a study done in 1993 by the Thrombosis Research Institute in England which showed that cold water dousing caused an increase in virus fighting white blood cells as well as testosterone and sperm count. According to the study, the heightened metabolic rate which is caused from the bodies attempt to warm itself, activates the immune system which then releases more white blood cells to combat the threat. White blood cells are a key factor in warding off dangerous free radicals, virus, and bacteria. There is a growing body of researchers who are looking into the correlation between cold water and stroke patients. There was a study where 19 stroke patients who’s conditions were not improving from the use of medical grade drugs were monitored over a period of three months. Ten of these patients were given cold water treatments that are identical to dousing. At the end of the three months the ten who underwent the water treatment had significantly lower disability with higher motor skills and kinesthetic awareness. There is new research also looking into whether lowering the temperature of stroke victims immediately after the stroke could reduce brain damage and whether continued use can limit further damage through pharmiseutical drugs. In Russia scientist are also studying if applying mild hypothermia to stroke victims would be beneficial. In the United States a new theory is making its rounds stating that diabetics submurged in dry ice baths have had a decrease in symptoms and an increase in muscular performance. Ice baths are also becoming a staple in the treatment of heat stroke. Cold water dousing is on the verge of becoming the next big trend within the ever prevailing health conscious and athletic culture alike. During the 2003 Rugby World Cup, many athletes were noted to have used ice baths in order to hasten recovery time and keep fatigue at bay. Coupled with proper eating and frequent physical activity, cold water can accelerate your weight loss due to the boost of metabolism. Cold water showers have proven to be an excellent treatment for depression and insomnia due to the relaxing properties. On the flip side, having a cold shower in the morning can act as an energy shot. The only risks involving cold water dousing are if you have had a history of heart issues. If this is the case I would suggest subtly cooling your showers over time so your body doesn’t get quite the shock effect. After continuously cooling down your showers, try implementing only cold showers and view the results. Based on the evidence, cold water dousing could easily sky rocket to become a staple in our daily lives. The pros of prolonging a healthy happy life vastly outweigh the cons of having a scorching hot shower which is ultimately deteriorating your health. 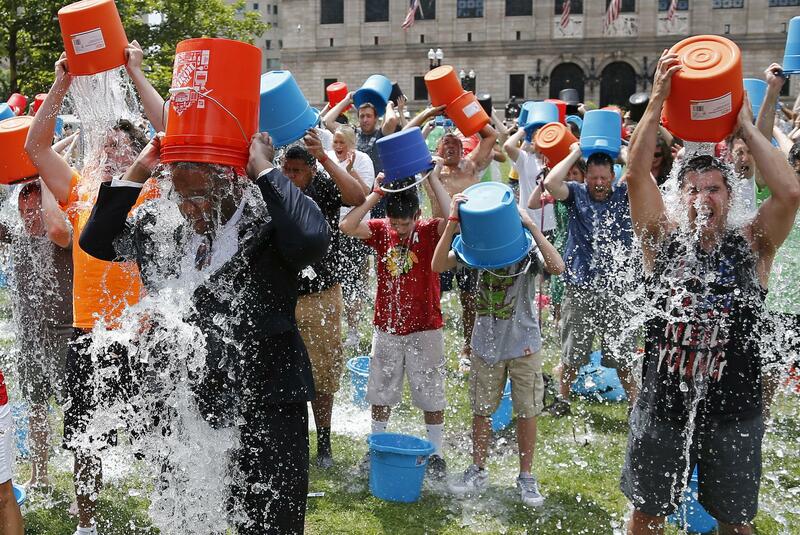 Next time someone nominates you for an ice bucket challenge, you’ll be happy to oblige. This entry was posted in Health and tagged als, cold water, cold water dousing, dangers, health, health benefits, healthy, history, ice bucket challenge, science, system on September 10, 2014 by joshelsey.